It all began in the late 1800s. Stiffeners were needed to make the paper packs holding cigarettes stronger. Eventually, instead of using blank pieces of cardboard, pictures were added to the cardboard. Just like today, you did not know what card would be in your pack - but this time, it was your cigarette pack. This was the beginning of a hobby that has endured for more than a century. Eventually, cigarettes were packed in cardboard boxes and stiffeners were no longer needed. Cards were still inserted because it was obvious the cards helped to sell more cigarettes. Of course, the dangers of cigarette smoking were not known at this time. In 1880, the Thomas Hall Company of New York produced a set of more than 500 insert cards with actors, actresses, presidents and athletes. The cards were done in a brown and white sepia tone. Later, photographers learned to use color and the tobacco companies were probably their best customers. When the popularity of insert cards in cigarette packs waned, larger cards began appearing in bread and candy. In 1933, cards were inserted in gum packs - supposedly to sell the gum. The companies were interested in selling the gum and did not concern themselves with the damage it might do to the cards. In the late 1980s and early 1990s, the gum was removed from the packs and the insert cards became the main product. During the 1970s, stickers were added to the card packs in order to create more interest. Collectors liked the stickers so some sticker-only sets began to appear. There were even packs containing stickers with cards as the insert. In the 1990s, more and more printing technologies were developed. Remember holograms? We thought they were terrific. With their use as inserts, the term "chase cards" was born. Stickers usually appeared one per pack but holograms were much harder to find, at the rate of approximately one per six packs and so collectors had to "chase" after them. Eventually, holograms were used for complete sets. There were foils, chromes, holochromes, canvas, etched foils, glow-in-the dark, prisms, omnichromes, heat sensitive cards and others used as insert cards. All of these were used to make collecting cards more interesting. It seemed like the technology was getting better and better, and there was no end in sight. Most of the aforementioned technologies have now become pass� and the hot inserts chased after today are autographs, memorabilia cards and sketch cards. These inserts are quite pricey and collecting all of them as part of a set is often too expensive for the average collector. While creating added interest for many collectors, they have acted as a turn-off for other collectors. Many of you will remember Dino Frisella from his days in the card business. He entered the market 16 years ago when his company Dart Flipcards produced Vietnam Fact Cards. This was an innovative set and over the years, Dart continued to show more innovation with, besides non-sport cards, such products as plush bears, bobbin' heads and the award-winning Sailor Moon Collectible Game Cards. Frisella is now heading a company called Gemstone Treasures. As the name indicates, Frisella plans to take collectors on a treasure hunt with Gemstone Treasure Cards. This product brings two collectible markets together - the non-sport card market and the gemstone collecting market. One might ask, what do these collectible markets have in common? Many non-sport cards act as a history of the times we are living in. Gemstones also are associated with history as they relate to such things as the treasures of the Egyptian pharaohs or turquoise associated with Native Americans. They also present a history or geography lesson for those who wish to delve into where the mines with gems are located. Besides the enjoyment of collecting, most non-sport card collectors collect with the thought in mind that their collections will become more valuable as time goes on. Their collections are like money in the bank if an emergency ever arises. If we collect stamps, we can always use them at face value for postage. Most coins can be spent. Card collectors do not have these luxuries. Parts of our collection may have risen in value, while other parts may have dropped in value. In case of an emergency, it is not always easy to sell a large collection to obtain a needed sum of money. Gemstone Treasure Cards will most likely never go down in value. Frisella has inserted high-quality gems, in many cases worth more than the $15 per pack price. When asked the question if you were buying these exact same gems at a gem show what would be the comparative cost, he replied "Many of the gems would be valued at $50 or more. The lowest end would be $15 to $20 and you would not have the history and showmanship. Your show purchase would be placed in a paper or cloth bag." First, you have a large box (6�" x 9�" and 5�" deep). 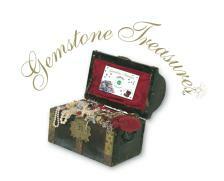 There are pictures of treasure chests and gemstones all over the attractive box. Inside this box, there are eight smaller boxes in shrink wrap (6�" x 5" and over 1" deep). The smaller boxes act as further protection for the gemstones, which come in plastic cases (3�" x 2�" and �" deep). On the inside of these boxes, there is a frame around the plastic cases, which acts like a checklist for both the regular and subset stones. There is a checklist on the bottom of the boxes and also the odds for finding the subsets. Inside the plastic cases, there's an attractive border card surrounding the opening where the gemstone is housed on a piece of Styrofoam. The case has a seal on either side. The name of the gemstone appears along the side, as well as on the border card. On one side of the case, there is a number and on the other side of the case, there is the total ct. wt. The bottoms of the plastic cases show a card telling all about the gemstone. The card is numbered and an approximate value is given. For this first series, Frisella did all of the packaging of the stones in the plastic cases by hand. He stated, "I put the card in the bottom of the plastic case, next the Styrofoam, then I centered the stone or stones, added the top piece and the seals. All of the stones were hand-weighed and the weight was hand-written. The packaging was very expensive." 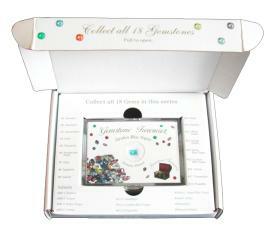 If you purchase a box, you get eight gemstones, including a subset. 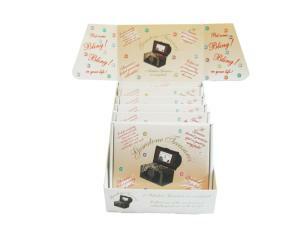 A 48-piece case retails for $720 and you will get two sets of 18 gemstones, six specials and several extras for trading. 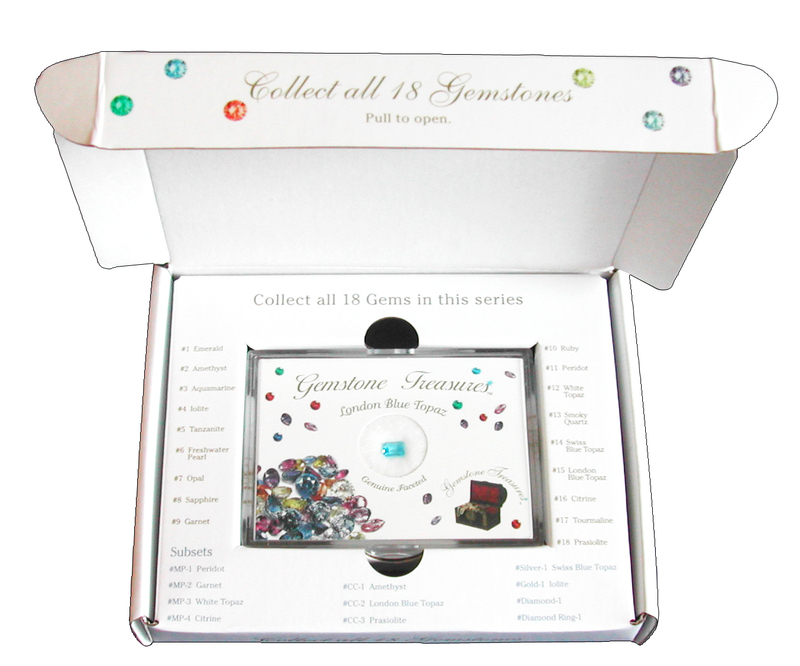 The idea is to collect all 18 gemstones and perhaps the six subsets. The 18 gemstones are: #1 Emerald, #2 Amethyst, #3 Aquamarine, #4 Iolite, #5 Tanzanite, #6 Freshwater Pearl, #7 Opal, #8 Sapphire, #9 Garnet, #10 Ruby, #11 Peridot, #12 White Topaz, #13 Smoky Quartz, #14 Swiss Blue Topaz, #15 London Blue Topaz, #16 Citrine, #17 Tourmaline and #18 Prasiolite. This is a great start to a gemstone collection and will certainly whet your appetite for wanting more. They can also be used by jewelry makers. The interesting subsets are Matched Pair (a matching pair of gemstones), Carat Club (all gemstones in this category weigh one carat or more), Silver Series Ready to Wear (a one carat or more gemstone mounted on a .925 silver pendant and chain), Gold Series Ready to Wear (a one carat or more gemstone mounted on a 14k gold pendant and chain), Diamond Ring Ready to Wear (a diamond accent ring) and Diamond Series (genuine faceted diamonds worth hundreds of dollars). The ratio for the subsets is as follow: Matched Pair (1:14.5 packs), Carat Club (1:29), Silver Series Ready to Wear (1:55), Gold Series Ready to Wear (1:384), Diamond Ring Ready to Wear (1:4,800) and Diamond Series (1:3,200). When asked what gave Frisella the impetus to become involved with gem stones, he had an interesting story to relate. "Watching TV a couple of years ago, I saw a one ct. emerald ring with diamonds surrounding it being offered on one of the jewelry shopping channels for $450. I had paid $650 several years before for a much smaller ring for my wife. I decided to order the ring and when it arrived, it looked sensational. I took it to the mall and had it appraised by five different jewelers. The appraisals ranged from $3,500 to $6,000. The next time I saw the ring offered, I ordered it again. As soon as I received the second ring, I knew the stone was not nearly as nice. This was proven when I took it for appraisals. I became interested in exactly what created the difference and learned it was clarity, color, size, etc. As it turns out, size isn't always important because a large stone can be very ugly when it's far from perfect and a small stone can be beautiful." Wanting to do something different in the card market, Frisella got the idea to combine gemstones with cards. He was fortunate to make contact with someone who deals directly with the mines, thus eliminating many middle men. Mines are all over the world so having one contact helped this project along. There is a question as to whether or not Gemstone Treasures will appeal to card collectors. According to Frisella, the sport market seems to accept them more than the non-sport market. "They appreciate the value. At the Sports National, one dealer decided to buy a pack for his wife. He later bought three packs and for the next two days bought a box each day. He told me 'At least I know I'm going to get something in each pack!'" The bottom line is you're not just getting a piece of cardboard, which may or may not have any value, but something of certain value. After all of the stones are exhausted from a mine, you never know if and when more of the same stones will turn up. Tanzanite comes from one small area in Tanzania and was discovered fairly recently in 1960. This stone is the most sought-after stone on the planet right now. Wouldn't it be exciting to find one of these in your Gemstone Treasures box? The least expensive carat is $50 and can range up to $4,500 for a carat with good color. Iolite retails for $400 to $500 per carat. A ring with aquamarine in the one carat range can cost $2,000. Diamonds are very costly and controlled. It would certainly be exciting to find a diamond accent ring, valued at $100 to $200 in one of the packs. The pearls in the packs are valued at least at $50. So if you've always dreamed of finding buried treasure, collecting Gemstone Treasures might be the next best thing. Roxanne Toser has been the Publisher of Non-Sport Update magazine since its inception in 1990. Before that, she operated a very busy non-sport trading card mail order business dating back to the 1970s.